Sweater in progress, colors are nicer than in the photo! No peepers are involved here! I am only speaking of the sweater I began knitting about a year ago. Beautiful yarn from our flock that I had hand-dyed. I have been working on this neck-down sweater for the past year, and I have gotten far enough that I believe I cannot go much farther. I dyed the skeins that I thought I would need, and I think it was not enough. 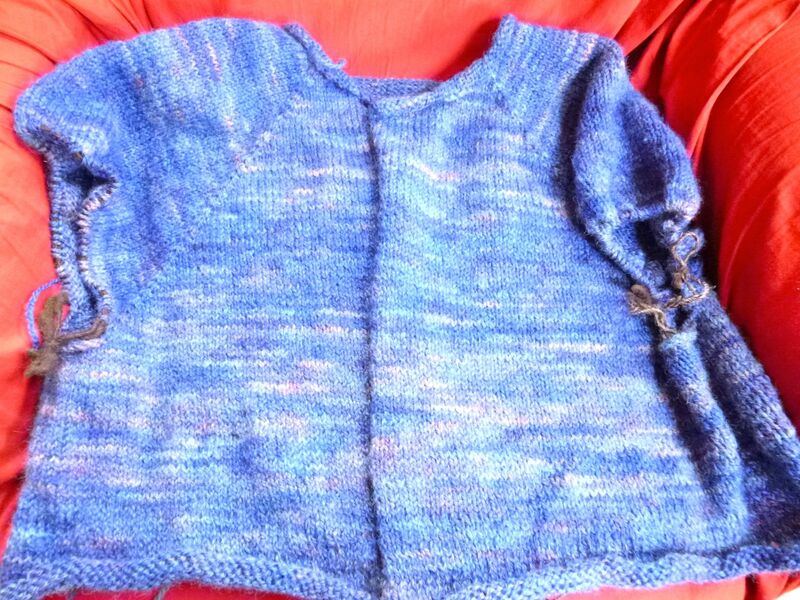 I am not finished with the body of the sweater and there definitely is not enough yardage to knit the sleeves, even if I used a different yarn for the trim band. And so I am thinking about frogging the project and knitting a lovely vest instead of a sweater! It might be just the ticket. I love, love love the yarn, so I guess that I can rip-it, rip-it, rip-it. And move on. Big sigh.